There are similarities here, but the difference between the two is big. 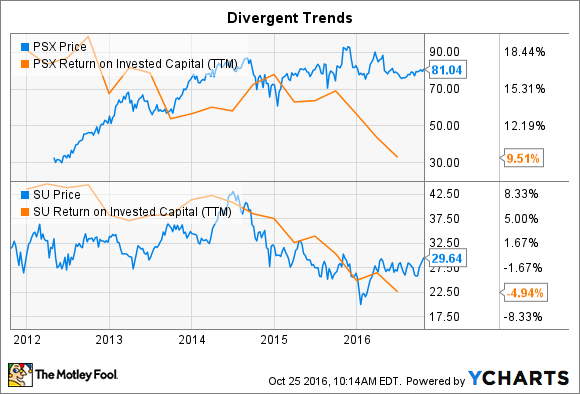 Which is a better buy: Suncor Energy Inc. (NYSE:SU) or Phillips 66 (NYSE:PSX)? The answer may depend on what piece of the energy market you're looking to invest in. However, oil prices are another issue you'll want to think about carefully. When you boil things down, one very big thing separates this pair. The first thing you need to understand about Suncor Energy is that it's a play on the Canadian Oil Sands. In fact, oil sands make up nearly 90% of the company's 7.7 billion barrels of reserves. Clearly, the company has other oil operations, including Norway, the U.K., Libya, and Syria. But the future of Suncor is really tied to the Canadian oil sands. Phillips 66, meanwhile, doesn't drill for oil. It's business is focused on what comes after the drilling, including midstream, chemicals, and refining. The company's chemicals exposure comes from a 50/50 partnership with Chevron. Midstream, meanwhile, moves oil from where it's drilled to where it's used, and Phillips 66's exposure here is largely made up of its investment in Phillips 66 Partners LP (NYSE:PSXP). Phillips 66 Partners LP is an interesting relationship because Phillips is the general partner of the LP, allowing it to earn a fee for managing the assets. It also owns partnership units so it gets distributions. And it can earn incentive payments for increasing the distribution over time. All the while, it gets to retain control of assets that it has sold, or dropped down in industry speak, to the partnership -- allowing it to raise cash for further investment at the parent company without losing control of key assets. Suncor has similar assets to Phillips 66, but they aren't the main focus of its business. It's oil that rules the day. So if you're looking at Suncor and Phillips, the first question you have to ask is, what part of the energy industry do you want to focus on? If the answer is the oil part, then Suncor is the better choice, assuming you want to spotlight the Canadian oil sands. For reference, Canada's Alberta Oil Sands has the third largest oil reserves in the world, after Venezuela and Saudi Arabia. If you believe the oil industry has a long-term future, the size of the oil sands will make it an increasingly important piece of the global oil puzzle. And a big part of that is because of the long reserve life of oil sands projects, which can last up to 50 years. That said, there's another interesting thing that separates these two stocks; performance. Since Phillips 66's initial public offering in early 2012, the stock is up over 140%. Over the same time span, Suncor Energy has fallen 16%. Phillips advance has a lot to do with growth in its midstream business, but it's interesting to note that Phillips 66's return on invested capital was heading generally lower through that span. So a big piece of Phillips' advance appears to be related to multiple expansion. And falling oil prices have helped that along. Companies that have refining operations make money on the difference between their input costs (oil and natural gas) and the cost of what they sell (chemicals, gasoline, and such). Low natural gas and oil prices, as we've had in recent years, are often a plus for refiners and investors clearly know that. To put some numbers on that, Phillips remained solidly in the black as oil prices plunged in mid-2014 while Suncor has lost money in four of the past eight quarters. Clearly, oil price moves affect the two companies very differently and investors have reacted to the shares differently, too. But there's change afoot. Phillips 66's earnings peaked in 2014; held fairly steady in 2015, dropping about 7%; and have fallen off around 50% year over year in the first half of 2016. The reason is that margins are being squeezed primarily by falling prices for refined products, but it doesn't help that oil and natural gas prices have trended higher lately, too. But higher oil prices are very helpful to Suncor Energy's business. That's why Suncor is up around 8% over the year-to-date period. In fact, Suncor's cash flow from operations had trended down for four consecutive quarters but picked up in the second quarter of the year. That's a hint that the worst may be over, though second-quarter earnings looked particularly weak because of write-offs related to fires in the Oil Sands region. All of that said, if you look at the chart above, Suncor's stock price has been following its return on invested capital lower while Phillips 66's stock has been heading higher while return on invested capital has been falling. 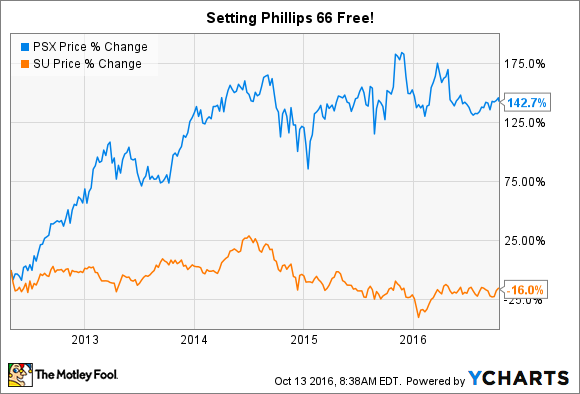 That makes Phillips appear a lot less desirable now that its starting to face business headwinds. Suncor, on the other hand, could soon have the wind at its back--or at least a breeze--instead of running headlong into an oil price tsunami. In other words, Suncor could be the better value if oil prices strengthen, as they appear to be doing. If you're trying to figure out which is the better buy, Suncor Energy Inc. vs Phillips 66, then you have two things to think about. First, do you want to highlight midstream and refining (Phillips 66) or oil (Suncor)? But you also might want to consider the outlook for each, since rising oil prices, as we've seen so far this year, will help Suncor's business to stabilize and, perhaps, move higher. Conversely, rising energy prices mean rising input costs for Phillips 66, which could make life harder on the midstream-focused company. Right now, it seems Suncor could be in the better position to prosper.